There are no error prompts and the app will just revert to correct/previous settings when saving if something is configured incorrectly. Stop "Riing Plus Controller" service via "services.msc" or "net stop"
Just read about sync controller and it seems awesome. So you can also use 3 pwm signals from mb to control 3 groups of fans differently? Honestly this controller should be included with riing plus fans instead. Im quite far into the development of my own software, thanks for pointing that out tho. Interesting concept, making your own software. I'm a programmer myself and have thought about looking into trying to either add on to the current software or make my own. But I honestly don't have the free time for it. I'll be interested to see what you come up with. * Split design (service + gui). Small service runs in background and controls the fans so you dont have to have the gui running 24/7 in the tray. Theoretically this allows you to remote control the fans from another pc. Looks like some great progress. Let me know if you want a test user and some feedback. Did you try it? Im curious if it works for you. My apologies, but I have not had the opportunity to try it yet. I should be able to this weekend. I will let you know how it goes. 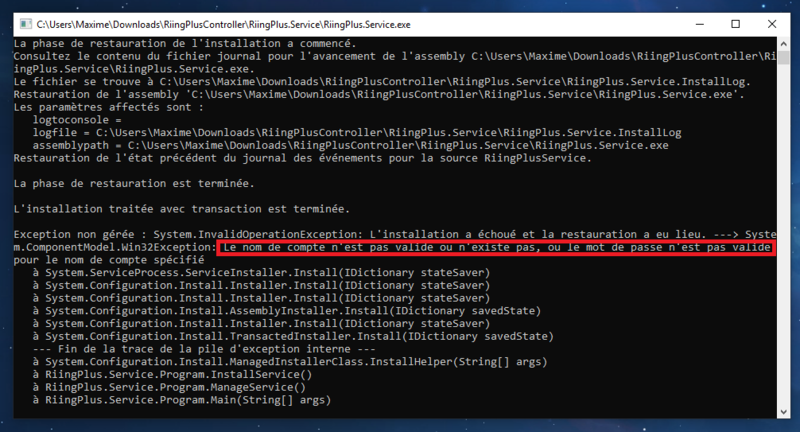 sc create RiingPlusService start=auto binpath="<path to service>" displayname="Riing Plus Service"
It will create the service to run as LocalSystem, you can change the user in the services management. If leave it to run as LocalSystem then you need to check the "Allow service to interact with desktop" checkbox. Thanks a lot! The right solution for me was ".\account". I'll try your software this weekend and I'll let you know how it goes. So, did it work for anyone? I finally registered here to answer. I tried it myself the last two days , but could not get it working. I followed your manual step-by-step but when i start running the Riing.gui, it tells me "waiting for service". I reinstalled again and again , clearing *.dll caches, disabled the original software and restarted. everything. it wont work for me, there must be something i'm missing. may u help me out? p.s. : does your software let me set different rpm for each fan, no matter what controller they're plugged to? Can you check if the service is running in services.msc? If not try to start it manually, and if it will fail to start please send me event log. If its running, you can try to disable firewall for a second. Yes, you can set either a constant speed from 0 to 100% or setup a custom pwm curve. This is per profile but you can assign just one fan to each profile and it will allow you to control each fan separately. It should also work with multiple controllers but I did not test it since I only have one. ok, since i'm at work i will try when i'm back home. I finally got around to trying the software. I like the fan curve implementation, and I really like that one can select which devices go to which profile. I always thought it would be neat to assign different speeds/colors to different groups of fans and lights. Both of these things are improvements I would like to see Thermaltake implement. Especially the fan curve. A fan curve seems like a basic requirement for any fan controlling software. While the software has a very primitive layout, it is very functional and to the point. It would be nice to be able to add and remove fan curve points. I ran into an issue when running the fans on "Flow" mode. The five fans on my first controller fall behind the fan and LED strips on my second controller. Also, not sure how the controllers get ordered in the software, but my second controller appears above my first one in the list. Would be good to make them appear in order, if possible. Finally, I am able to select ports that have nothing plugged in. I do know that thermaltake's software only flags an issue with empty ports until the user turns them off, so it just may be a limitation of the controllers to not be able to tell the software to disable the ports when empty. Great project so far. I'll be excited to see what you do next with it. I'd be super happy to test/troubleshoot more if requested, even with just manual fan adjustment i'd use this over the TT software. The reason why it does not detect your temp is because openhardwarelib does not support ryzen. There is an issue on github but its not merged, ill try to merge it and recompile. The fans default to 100% when the temperature sensor is not found, I guess you should still be able to set fan speed manually. Ill change that too. It would be nice to be able to add and remove fan curve points. You can add new points by double clicking anywhere on grid, and remove them by double clicking on the point. edit: Also you can double click on the led color to load it to the color selectors. I ran into an issue when running the fans on "Flow" mode. The five fans on my first controller fall behind the fan and LED strips on my second controller. Hmm, I dont think I can do anything about that. The software does not control the modes, it just sends some bytes to the controller telling it to enable specific mode. I bet this is a problem in the official TT software too. If there is no build in sync between controllers even a slight difference in controller's on board clock will eventually cause the effects to be out of sync. Finally, I am able to select ports that have nothing plugged in. I do know that thermaltake's software only flags an issue with empty ports until the user turns them off, so it just may ﻿be a limitation of the controllers to not be able to tell the software to disable the ports when empty. Thats not good, I actually never tested an open port as I have all 5 used. I figured pooling data for an open port will error out, that would cause it not being visible in software. But maybe instead it returns some specific data without error. Ill try to fix this. Ill use the top comment to post the app and as a changelog. v1.1 should fix all of your problems. 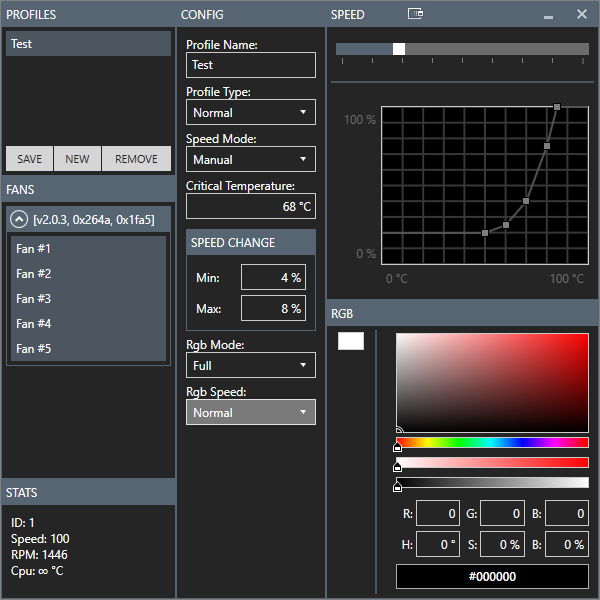 I've also added per profile temperature selection, so you can have one profile that uses your gpu temperature and another profile that uses cpu temperature. You should be able to just drag and drop over the last version. Can't believe I didn't think to double click on the fan curve grid. I'll have to play with it again. 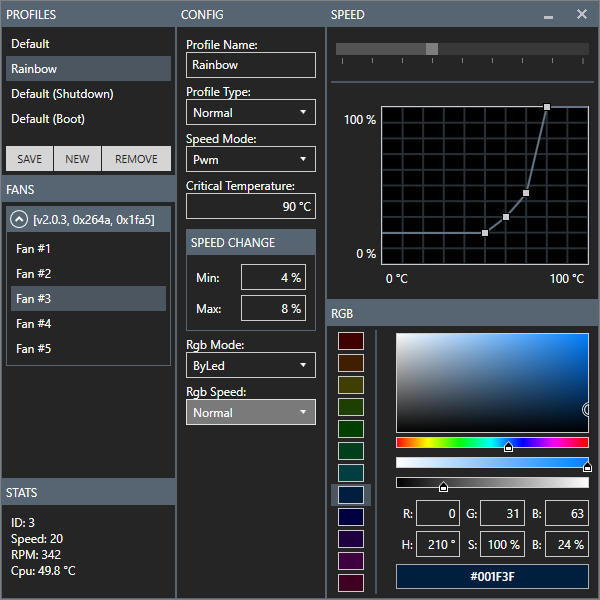 The issue I saw with flow mode I had also experienced with previous version of Thermaltake's software as well, but I have't seen it in a few revisions so maybe their software puts in a delay to keep them in check. Try v1.2, it should properly hide unused ports. edit: I think they are just setting each led manually from software instead of using the in controller built in flow mode. I was planning on adding custom mode support but it would be a big change in project structure. Because of the split design the service would need to send all info about custom modes to the gui, the configuration forms would be the worst. But you would be able to write mode "plugins" in c#, which would allow you to make anything you want. Like color based on cpu/gpu temp, time of day, sound or maybe flash the fans when you get discord notification. I've had thoughts about how to allow users to make custom speeds and effects. I know in another thread, Thermalmike stated that they speeds were all hard coded. I'm guessing they manually design the time delay between transitions and what a transition looks like. Being my background in programming is mostly OOP with Java and C++, I've wondered if one could simply have each lighting mode be an object and then each of those have their own function titled "transition". This should allow some sort of custom speed adjuster that would then call the mode's "transition" at the rate the user sets. This structure could also allow users to define their own transitions/lighting modes as well. Sorry, i was too busy this weekend and that's the reason i dind't give you a reply. still no changes, it wont work.. I'm feeling kinda dumb for asking this: do i create new login data while installing or do i use my...forum login ? to be honest i tried both and neither did work. if neccesary i can translate that into english, hopefully u can work with this information.